Haifa, Israel - The hydraulic ramp of a Turkish freighter taps down on the eastern Mediterranean port of Haifa and, under a full moon, 37 trucks roll off onto an otherwise empty pier. In a convoy that stretches hundreds of meters, the trucks travel east across northern Israel, bringing goods from Europe to customers in Jordan and beyond. 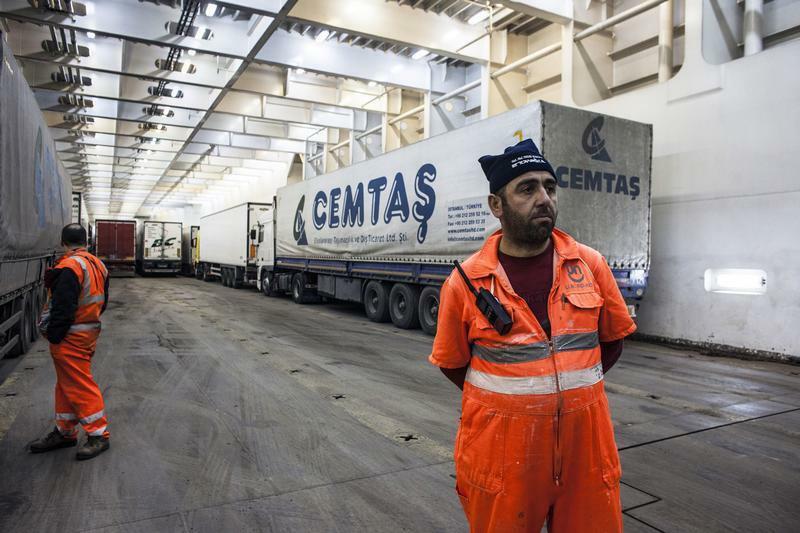 Until three years ago the cargo these trucks carry – fruits, cheese, raw material for the textile industry, spare parts, and second-hand trucks – would have come through Syria. But civil war has made that journey too perilous. “Too much problems, too much guns, too much fighting,” said Ismail Hamad, a 58-year-old Romanian driver. Hamad has driven through Syria for three decades, he said; now, only Israel. Three years after Syria plunged into violence, Israel is reaping an unlikely economic benefit. 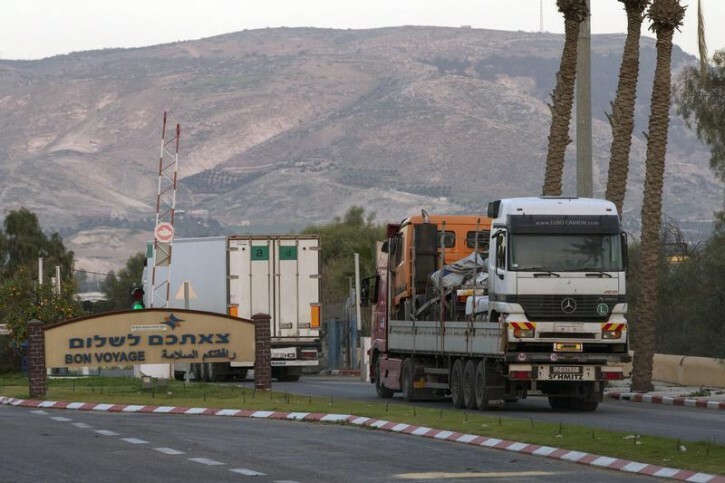 The number of trucks crossing between Israel and Jordan has jumped some 300 percent since 2011, to 10,589 trucks a year, according to the Israel Airports Authority. In particular, exports from Turkey – food, steel, machinery and medicine – have begun to flow through Israel and across the Sheikh Hussein Bridge to Jordan and a few Arab neighbors. Turkey’s Directorate General of Merchant Marine, part of that country’s transport ministry, said that transit containers shipped to Israel for passage on to other countries increased to 77,337 tonnes in 2013 from 17,882 tonnes in 2010. The trade, though still small, is growing enough to encourage long-held Israeli hopes that the Jewish state can become a commercial gateway to the Arab world. Israel plans to invest at least 6 billion shekels ($1.7 billion) in infrastructure over the next six years to improve the trade route. In the past, some Israeli businessmen and diplomats have lamented the way politics have hurt economic opportunities; others have kept any trade with their Arab neighbors quiet so as not to upset them. Now they see a chance to boost economic and political relations. “Israel is returning to its historic role, as a transit country, as a bridge between continents, where historic trade routes passed through,” said Yael Ravia-Zadok, head of the Middle Eastern Economic Affairs Bureau in Israel’s Foreign Ministry. She leads a group of Israeli government and security officials trying to figure out how best to encourage trade. The logic is simple: Goods from Europe and elsewhere destined for the wider Middle East are usually unloaded in Egypt before they make the several-hour drive to a Red Sea port, where they are loaded onto new vessels and shipped to their final destination. The routes from Haifa in Israel to Jordan, Iraq and even Saudi Arabia – used by the Ottoman and British empires up until Israel’s founding – are potentially much quicker and cheaper, shaving days, if not more, off a trip between Turkey and Baghdad, for instance. Costs could be cut in half. But opening up routes will not be easy. Politics and generations of enmity are difficult to overcome. Iraq itself is on the brink of civil war. Jordanian trade figures show a sharp rise in trans-shipments through Israel in 2012, but a fall in 2013. Jordanian officials say that Israel is overstating its role in the trade and point out that the vast bulk of re-directed goods still goes via Egypt. But Israel’s gain, small though it may be, is far more surprising because countries such as Saudi Arabia and Iraq spurn official relations with Israel. David Behrisch, managing partner at Tiran Shipping, an Israeli shipping agency, says business sprang to life in 2011 when organizers of the Jordan Rally found they couldn’t bring race cars in from Italy through Syria. As the number of motor vehicles crossing from Turkey into Syria plummeted - by close to 50 percent, from 106,750 in 2010 to 55,701 in 2013, according to Turkey’s International Transporters Association – most of the trade was diverted to Egypt. But thanks to a new Turkish route by sea to Haifa, some shipments also began crossing through Israel. “The reason this Haifa route has opened is entirely due to the war in Syria,” said an official at the Turkish company U.N. Ro-Ro that runs the new line. Tiran Shipping now runs 40-50 trucks a week to Jordan and moves 2,500 containers, or roughly 37,000 tonnes. Though the amount Tiran carries is only a tiny sliver of the $35.6 billion worth of goods Turkey exported to the region in 2013, it is up from zero a few years ago. Israel has “not even begun to scratch at the potential,” the Foreign Ministry’s Ravia-Zadok told a recent economic conference. Plenty of political and practical obstacles remain. The port in Haifa is state-owned and has limited capacity, a history of labor unrest and cumbersome security. Freighters in Haifa bay are typically forced to wait hours to dock. Trucks and containers have to pass through Israel’s lengthy security checks and scanners. The drivers, carrying international permits, meet passport agents onboard. Only after that can they take to the roads. An hour later the freight reaches the Sheikh Hussein Bridge and passes into Jordan. Normally, Jordanian law requires containers to be unloaded in the country’s Red Sea port of Aqaba, but that doesn’t apply to those passing through Jordan in transit or those that are stripped and moved onto Jordanian trucks at the border. According to numerous international businessmen who spoke to Reuters on condition of anonymity, goods continue from there into Iraq and Saudi Arabia. Documentation often shows the origin of goods but not their transit route, so the receiving authorities either don’t know about or ignore Israel’s role, according to Shlomi Fogel, owner of the Haifa-based Israel Shipyards. One example: steel from Ukraine, which is shipped to Iraq through Israel with Ukrainian documentation. 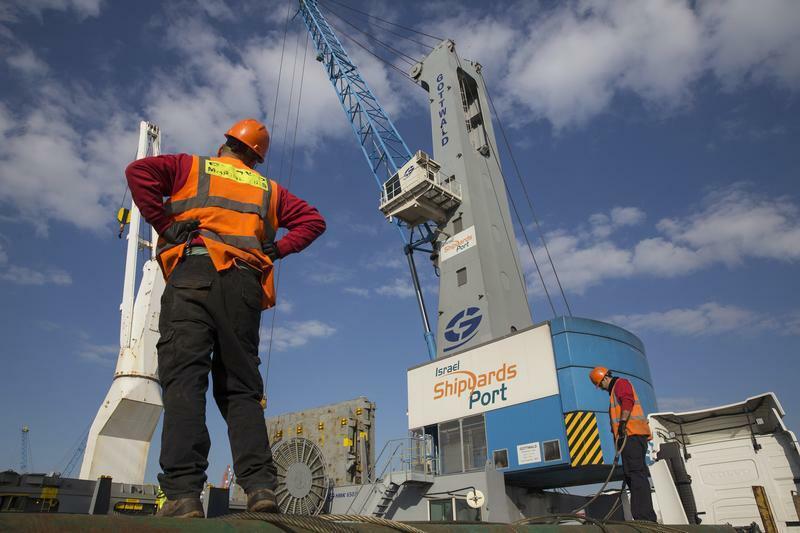 Return cargoes from the Arab world into Israel are inspected with even greater scrutiny. This is perhaps the weakest link in the trade route. Merchants say they could easily sell more from the Arab world through Israel were it not for Israel’s security procedures. Only 90 or so trucks from Jordan can cross the Sheikh Hussein Bridge each day and they routinely wait all day while Israeli officials check their contents. Fogel is working to ease that strain. 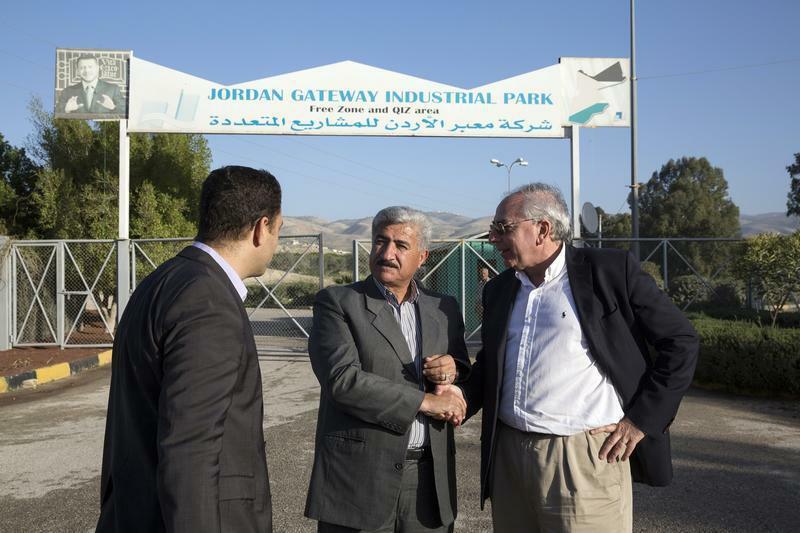 He wants to expand a free trade zone called the Jordan Gateway, which sits 6 km (4 miles) south of the Sheikh Hussein Bridge and straddles the Israel-Jordan border. One afternoon a few months ago, he stood on a hilltop above a rundown Jordanian army barracks and gazed at the 300 acre (121 hectare) park. The sluggish Jordan River that marks the border snaked through the green valley below. “Up here we will build a cafe and people from around the world will come and do business,” he said. Working with the family of late international financier Bruce Rappaport in Switzerland and with the wealthy Dajani and Kawar families in Jordan, Fogel wants to create a customs-free zone, where cargo can be dropped off or picked up from either side 24-hours a day, companies can build factories, and everything, including security, is managed privately. Already it is one of five such zones in the country from which goods manufactured in collaboration with Israel can be sold to the United States without tariff or quota restrictions. Seven factories are up and running on the Jordanian side of the zone, an increase from just four factories at the start of this year, the park’s Jordanian general manager Qasem al-Tbaishi said. The planned industrial park will bring a boost to Jordanians nearby who depend on farming and are much poorer than the Israelis across the river. Israel has given approval and budgeted 60 million shekels ($17 million) to build a bridge directly into the trade zone. The gateway group hopes Jordan will approve the plan within months. Israel’s Zoko Enterprises moved its car filter plant to the Jordanian side of the zone three years ago to save on labor costs and gain access to Arab markets. Gilad Hadassi, general manager at Zoko’s Israeli subsidiary Gur Filter, says companies from countries like Saudi Arabia and Qatar, which don’t have diplomatic relationships with Israel, are willing to buy from a Jordanian company. Israel plans to build two $1 billion ports to be run by foreign operators - one in Haifa, the other 80 km (50 miles) south in Ashdod. The new Haifa port will have a capacity for 1.5 million containers a year, roughly doubling current levels. A railway from Haifa to Beit Shean, not far from the Jordan border, will be completed this year, and a final leg is being planned, so that by 2017 a steady flow of containers could travel by train all the way to the border. “We can be an alternative for an individual producer, but for the big picture we won’t replace the Suez Canal, which is something huge,” said the CEO of the Jordan Gateway, Yuval Yacobi. The developers hope for approval from Amman this year. The project would take up to five years to build. Some analysts remain skeptical that Jordan will agree to use Israeli gas. But in February the partners in Israel’s huge Tamar field signed a 15-year deal with two Amman-based companies to supply $500 million worth of gas. If these arabs had half a brain they'd run to make peace with Israel so they may reap the benefits of trade with Israel, an economic power house in waiting! Forgive my ignorance , but what is wrong with this story ???? When are we going to learn not to be such "Bleeding Heart Liberals " ??? Please no moronic responses ....my heart is really hurting !!! !